Algiers — Peaceful popular marches resume in Algiers and in other provinces for the third consecutive Friday, demanding deep political reforms and a change in the system. This Friday's marches were marked by a remarkable presence of women, coinciding with the celebration of World Women's Day. The first demonstrators begun to converge, in the morning, towards Algiers (city centre) where rallies were observed at the Grande Poste as well as 1 May and Maurice Audin squares before crowds moved, in the early afternoon, through the main arteries of the capital, brandishing the national emblem and chanting slogans for a change in the system and against President Abdelaziz Bouteflika's candidature for a new mandate. Many politcal figures and artists partook in these marches that were supervised by the police. In other provinces in the country, similar peaceful marches involving thousands of citizens were also took place under the same slogan, under the watchful eye of a security system deployed to prevent any misconduct. Many political figures and artists partook in these marches that were supervised by the police. 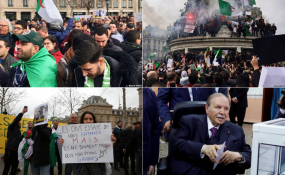 In the east of the country, citizens, young and old, men and women, demonstrated to demand political reforms, particularly in Batna, Constantine, Tebessa, Guelma, Skikda, Oum El Bouaghi, Annaba, El Tarf, Souk Ahras, Khenchela, Bordj Bou Arreridj, M'sila, Mila and Setif. In the West, thousands of citizens, with a strong presence of women, gathered in front of the headquarters of Oran's Provincial People's Assembly (APWI) Oran. Marches were also organized without any incidents in Tlemcen, Mostaganem, Mascara, Saida, Sidi Bel-Abbes and Aïn Temouchent. In Blida, Tizi Ouzou and Bejaia, citizens chanted the same slogans, insisting more particularly on "preserving national unity."